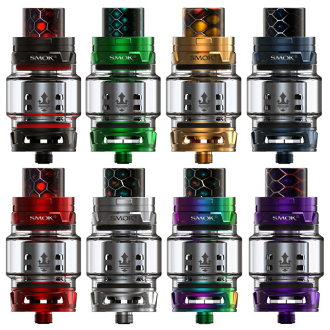 The TFV12 Prince Tank is constructed of stainless steel and has a food-grade convex glass tube. This top-filling tank has a newly designed top cap with a patented locking system, simply press the button on the cap and the cap will flip open. The coils utilize new cores with 12 holes. This allows the e-liquid to saturate the cotton and dissipate heat. This tank is 510 threaded and has a colorful wide bore resin drip tip.